Extra Loud Alarm Clock with Large Numbers. The Wake Assure™ Alarm Clock, by Clarity®, provides a super loud alarm of up to 85+ decibels as well as a visual alarm indicator. With a powerful bed shaker and a lamp flasher connection, the Wake Assure™ is an ideal solution for those with a moderate hearing loss. 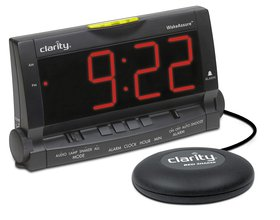 The Wake Assure™ Alarm Clock, by Clarity®, provides a super loud alarm of up to 85+ decibels as well as a visual alarm indicator. With a powerful bed shaker and a lamp flasher connection, the Wake Assure™ is an ideal solution for those with a moderate hearing loss.